Happy Friday morning from the Gallery of the Absurd! 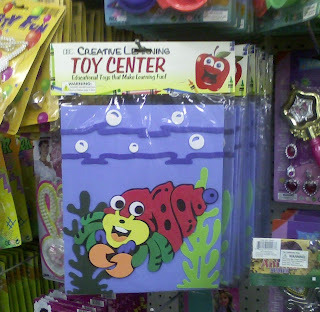 This apparently is a "creative learning" item that, according to its label, is one of the company's "educational toys that make learning fun!" Not too sure what is so educational about this thing...especially given the fact that it's difficult to figure out just what the hell this thing is! Can you guess what creature is featured on this toy? Why is the apple screaming? That's a hermit crab. A very strange hermit crab.